Hugo goes to a great safari tour. 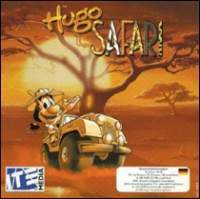 This game brings you Hugo and his friends closer on a safari . Join the little troll on his interesting safari tour in four different games and additional movies! It includes a compilation of these mini games: mountaineer from Hugo - På Nye Eventyr (1991) ( Amiga ), aviator from Hugo - På Nye Eventyr Del 2 (1992) ( Amiga ), music cafè, tomato battle / cable both from Hugo: Fantastische Welt (1998) ( PC WIN ) , Key & Flash endgame wildlife safari which is an original game where you distribute stickers of animals in a savanna environment, and a trailer for "Hugo Safari VHS / DVD".